A handicap parking space is available behind the museum. Please contact reception to arrange parking permits. Visitors can find street parking and parking garages nearby. Take the 11, 17, or 18 trams to Tullinløkka. 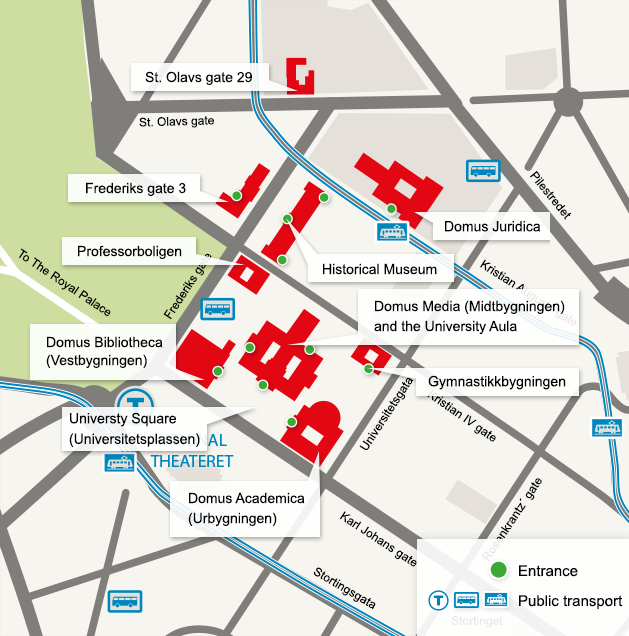 Or take any metro line to the National Theatre (Nationaltheatret) and walk one block. A number of regional buses stop close to the museum. Visit Ruter.no to plan your trip. The building has four floors and a basement. The southern wing on the 3rd floor is not wheelchair accessible. Entrances: Three entrances are accessible by steps. One entrance at the back of the museum is accessible for wheelchair users. Lift: The museum has a cargo lift (295cm x 205cm) at the back of the museum. To use the lift, patrons must ring the telephone number posted by the front entrance. Toilets: Toilets are located on the landing between the 1st and 2nd floors. Toilets for disabled persons are located on the 3rd floor. Accessibility: Some interior doorways have high thresholds, non-standard widths and heavy doors. The building is not equipped with a wire loop. Please notify the staff if you need assistance or if there are other ways we can accommodate you.